As a young and popular scion of an important family line, your future in the Star Empire looked bright - much to the chagrin of your less charming elder brother. So when your father died, your brother took the opportunity to rid himself of the competition. He assigned you to a dead-end post as governor of Morix - an insignificant small world, far removed from the splendor and opportunities of the Imperial Capital. Now you must use all available resources of your new unwanted domain; harvest and trade raw materials, in order to earn enough money and influence, to be able to return home, and reclaim what is rightfully yours! 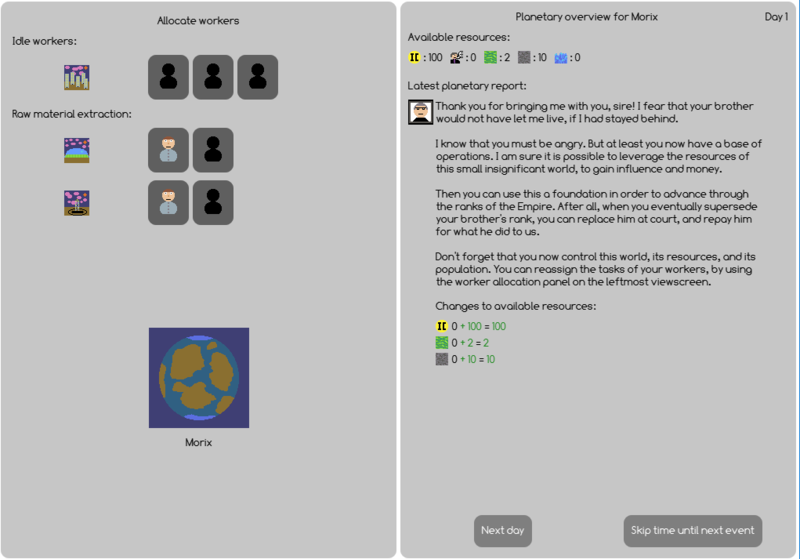 “The Morix Colony” is a strategy game, where you balance the resources of your small colony, while fending off space pirates, and gathering enough money and influence to challenge your brother at the Imperial Court. The objective of the game is to achieve the rank of Duke, and thereby outrank your brother (or find the hidden alternate victory-condition). Also note that most of the in-game icons have tooltips, explaining the mechanics of the game. The game was made in Java, using the LibGDX framework. Java is required, in order to run the Windows and Linux versions of the game.